Just add the link to your cart and check out to read the book Faro Exposed: The Gambler and His Prey by the author of "The Man-Traps of New York". Below is an overview of the game of Faro by Geno Munari. Faro was by far one of the fairest and even games to play, that is, when it was dealt on the square (honest). The crooked Faro dealing box came on with the crap shooting era, and soon put the game of Faro in bad odor. 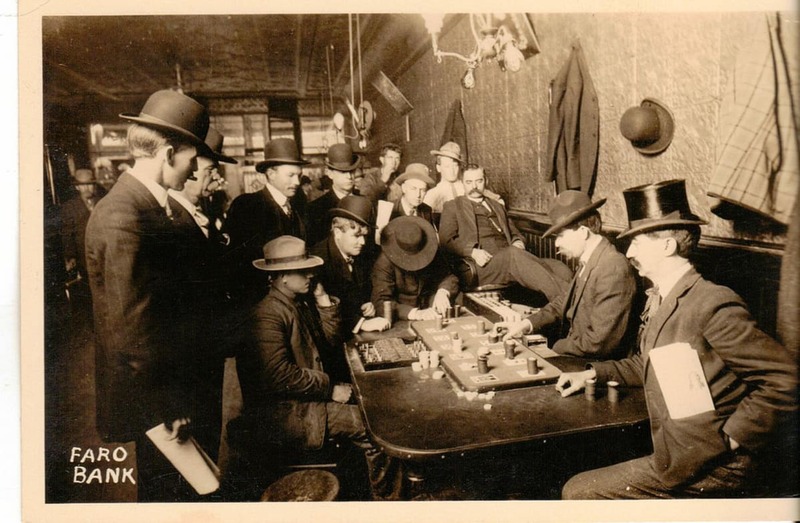 But fairly dealt and backed by an honest banker, the game was one of the most fascinating games ever dealt. Las Vegas put to sleep the last Faro game, which was at the Aladdin Hotel in the 70's. Today, It can’t be found anywhere. It has been said that when President Roosevelt was talking about a square deal, he was referring to a Faro game. When you say you are "keeping cases" or "keeping tabs”, or when you offer to “copper” a man's statement or prediction, or when you have picked a "sleeper", you are really using the jargon that was coined at the Faro bank. Faro dates back to the reign of the monarch, Louis XIV, during whose reign it came into vogue among the high rollers and "big wigs" (another old phrase dating back to those times) of France. The name of the game is derived from the pictures of the Egyptian Pharaohs which were positioned on the backs of the cards used in the game. The evolution of the game before it reached France probably follows the history of playing cards back through the Orient to Egypt. It was imported from France in the early 1840's and played feverishly across the United States in such cities as New York, Boston, Saratoga, Long Branch, Chicago, St. Louis, Kansas City, New Orleans, Hot Springs and finally made itself West into Reno, Las Vegas and San Francisco. Near the turn of the century Kansas City was the mecca for big games. Following the civil war, more than 32 banks were operated within two square miles. Even Henry Clay was a player. It was a popular pastime of the times. The game of Faro is simple enough at its conception, but as it grew into being it became quite complex in the various methods of play. It required expert judgment and manipulation, not only on the part of the dealer, but also on the part of the player. The game was played on an oval table which could handle up to 20 or more players with many more standing behind occasionally making an outside bet. The dealer had to be on his toes. He had to tell from the sound of someone speaking or the hands of the bettor, who was making the bet and, to whom should be paid the money from a winning bet. The layout, on a green felt cloth, was comprised of a full suit of spades painted directly on the cloth. The earlier layout of the cards was in the form of a horseshoe. In later years the cards were arranged in two rows, six across with the odd card between the two rows. 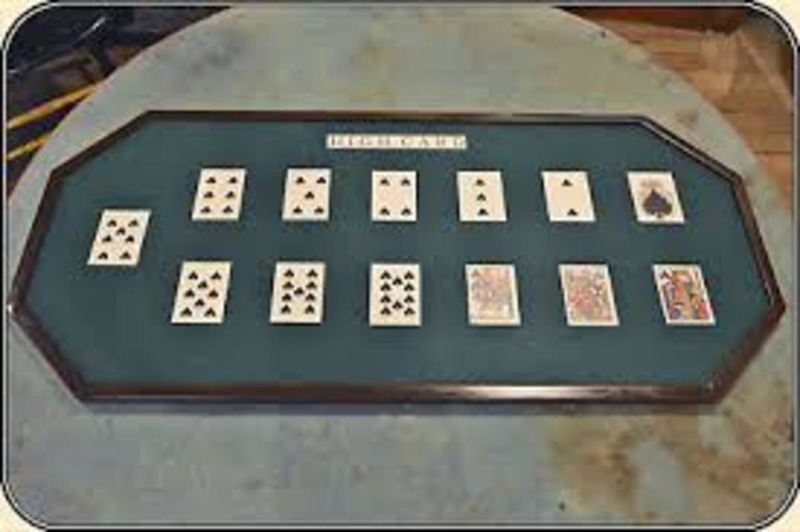 The ace, deuce, trey, four, five and six, formed an arm nearest the dealer. The king, queen, jack, ten, nine and eight, were the arm nearest the players. The seven stood alone between and to the right of the six and eight spot cards. The ace, deuce, trey and queen formed what was called the "big square", the deuce, trey, queen and jack the "second square" and so on. The six, seven, eight combination was called the "pot". Faro was played a standard 52 card deck. The dealer stood behind the table with the layout in front of him in the center of the table. He usually had two assistants, a .lookout and a case keeper. The lookout was very similar to a pit boss in the game of baccarat that sat on a chair above the play. He often advised the dealer, corrected mistakes and watched for cheats. The case keeper kept track of each card as it left the dealing box. 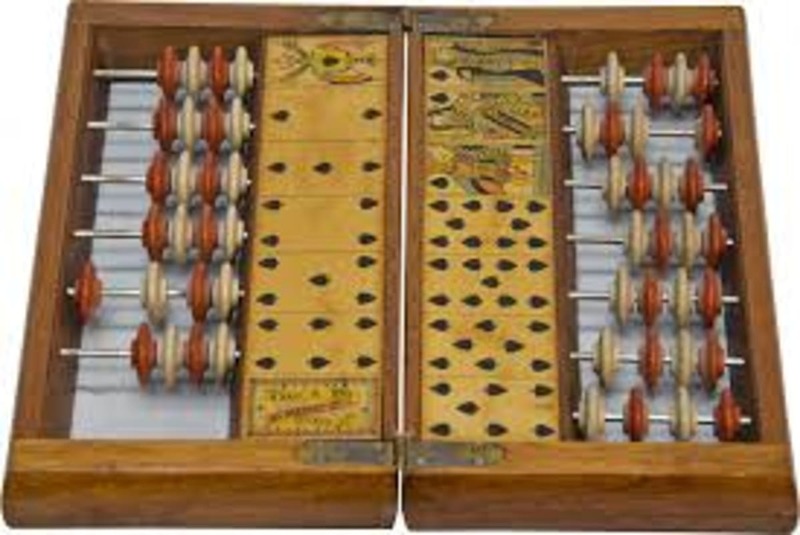 He used an abacus styled device that had a wooden button for each card in the deck. The four cards of each suit were arranged in a logical working order so he could easily note the played cards. The main tool for operating the game was the dealing box. It never left the custody of the dealer and was considered as prized as a cowboy's six shooter. The Faro box was constructed of metal, often sterling silver, and a little bigger than the size of a deck of cards. The box was open at the top, so that a card was always visible during the deal. There was a slit to the right of the box just large enough to let only one card at a time pass through the opening. The box was very similar to a Ziganette box that was used in an Italian card game called Ziganette. 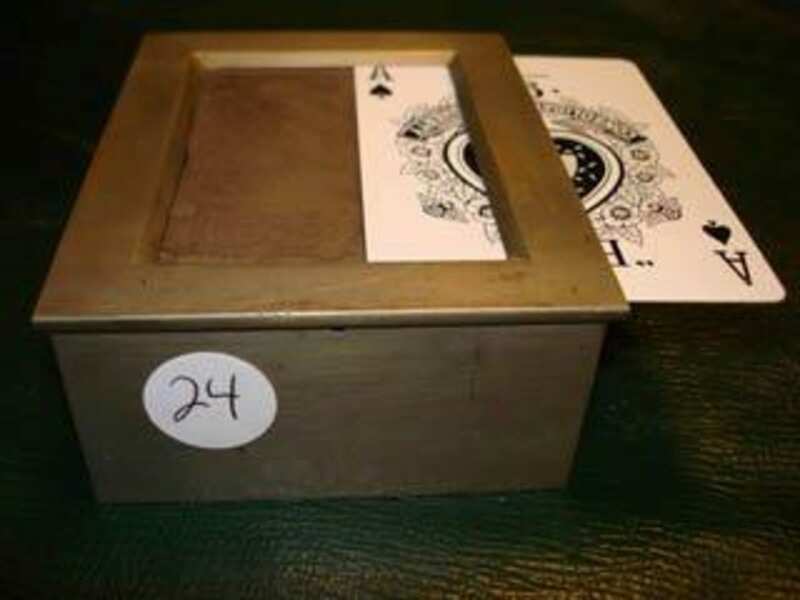 When the shuffled deck was placed in the box, the dealer was very careful not to expose even one card, as that would give the players a tremendous edge. Firm steel springs held the cards firmly in the box, in a face up position. The top card was called the "soda" card and the bottom card was called the "hock" card, hence the expression, "from soda to hock", meaning all the way, or soup to nuts. The dealer would then wait for the players to make their bets. Two cards were then dealt-the one in view and the one beneath it. This disclosed the third card, which then became the top card in the box. The first card from the box was placed in one pile and the second card dealt in another pile alongside each other. The first card exposed on the turn was the "losing" card and the card remaining in the box, the "winning” card. The first card was sometimes called the banker's card and the second card the player's card. But don't be confused, those were just names, the player could wager on either card. If he played to win he" placed his chips on the card, if he bet to lose he place a small copper disk, known as the "copper" atop the wager. Playing a card to win was also referred to "playing it open". When the bets were all down, the dealer would make the turn. When there were only four cards remaining in the box, with the top card of the four visible, and the remaining three in a random pattern beneath them, the players had the privilege of "calling the turn". This is guessing the exact order of how the remaining four cards will come out of the box. If the guess was correct the payoff was 4 to 1. The outcome had six possibilities. When two cards of the same number or court followed each other it was called a "split” and the house took half of the bets wagered. The manner in which the game was dealt left little room for any house advantage as is evidenced by the above description. It was cold gambling and that is what brought the demise to the game of Faro.